In this section we show some world GK related multiple choice questions i.e. MCQ. it is very important questions and very useful for those candidates who want to crack variouys competitive government as well as private sector exams like SBI , IBPS PO , IBPS Clerk, CET, Vyapam, UPSC, SSC, CGL, Police, SI, PSc, State PSC, Patwari, Samvida, Techer recruitment test, CTET, TET, Army, CDS, MAT , CDSE , SBI Clerk , SBIPO, PO, RRB , SSC 10+2 , CLAT , NIFT , etc .. 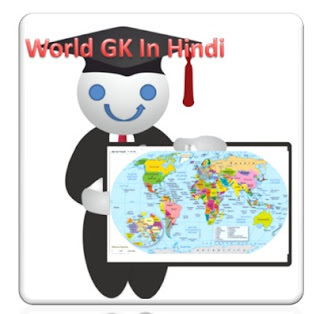 In this section we have 2 sets and collection of old or previous year exam questions and answers in Hindi. So, please learn and remember very carefully and prepare for exam. इस पोस्ट में हम विश्व से सम्बंधित कई बहुविकल्पीय प्रश्न दे रहे है जिन्हे याद करके विद्यार्थी जो सरकारी तैयारी कर रहे है उन पर्क्षो को आसानी से पास कर सकते है.